How much does a house cost in Worcester? If you’re thinking of buying a home in Worcester but not sure how much it will cost, then you’ve come to the right place. How much will buying a property in The Faithful City set you back by? Through our property selling services offered in the area and across the West Midlands, Love Your Postcode has earned a strong reputation in the local market, becoming one of the most in demand estate agents in Worcester. Worcester is a city in Worcestershire, England, 31 miles (50 km) southwest of Birmingham, 101 miles (163 km) west-northwest of London and 27 miles (43 km) north of Gloucester. In the 1950s and 1960s, large areas of the medieval centre of Worcester were demolished and rebuilt as a result of decisions by town planners. There is still a significant area of medieval Worcester remaining, examples of which can be seen along City Walls Road, Friar Street and New Street, but it is a small fraction of what was present before the redevelopments. 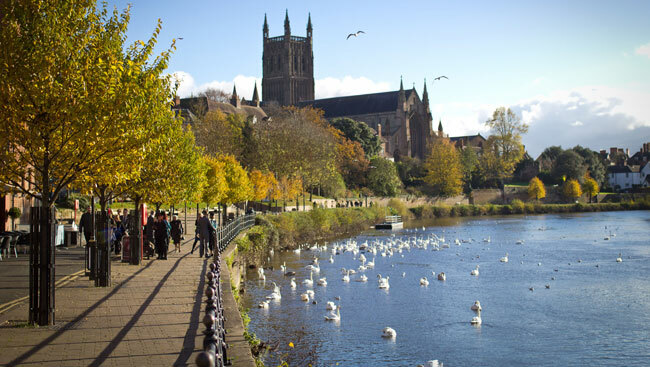 The city is best known for its magnificent Cathedral but is also famous for the world-renowned Worcester Porcelain, the piquant Worcestershire Sauce and the most picturesque cricket ground in the country. Worcester is surrounded by some of the most beautiful country landscapes in England. Most notably the Malvern Hills, which tower gracefully above the river and city and have been described by some as a mountain range in miniature. What’s the average house price in Worcester? Most of the sales in Worcester over the past year were detached properties which on average sold for £323,997. Semi-detached properties had an average sold price of £212,178 and terraced properties averaged at £181,887. Worcester, with an overall average price of £226,900, was cheaper than nearby Fernhill Heath (£300,294), Kempsey (£309,111) and Crowle (£274,464). In the past year house prices in Worcester were 4% up on the year before and 9% up on 2015 when they averaged at £207,216, says Rightmove. The average price for property in Worcester stood at £266,732 in May 2018. This is a rise of 1.56% in the last three months (since February 2018) and rise of 2.12% over the previous year. In terms of property types, flats in Worcester sold for an average of £151,999 and terraced houses for £190,690. This is according to the current Zoopla estimates. Coventry Lettings , Wolverhampton Lettings , Sutton Coldfield Lettings , Worcester Lettings . Love Your Postcode Group has become one of Worcester’s top estate & lettings agents because of how our group pays attention to each client. With us, you’re guaranteed a trusted partner that employs skilled and experienced staff that anticipates your every need.